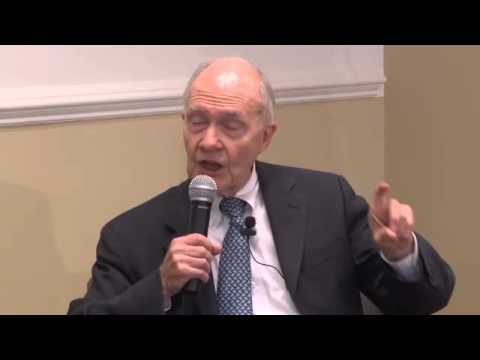 Brent Scowcroft has served as the National Security Advisor to both Presidents Gerald Ford and George H.W. Bush. From 1982 to 1989, he was Vice Chairman of Kissinger Associates, Inc., an international consulting firm. In this capacity, he advised and assisted a wide range of U.S. and foreign corporate leaders on global joint venture opportunities, strategic planning, and risk assessment. His prior extraordinary twenty-nine-year military career began with graduation from West Point and concluded at the rank of Lieutenant General following service as the Deputy National Security Advisor. His Air Force service included Professor of Russian History at West Point; Assistant Air Attaché in Belgrade, Yugoslavia; Head of the Political Science Department at the Air Force Academy; Air Force Long Range Plans; Office of the Secretary of Defense International Security Assistance; Special Assistant to the Director of the Joint Chiefs of Staff; and Military Assistant to President Nixon. Out of uniform, he continued in a public policy capacity by serving on the President's Advisory Committee on Arms Control, the Commission on Strategic Forces, and the President's Special Review Board, also known as the Tower Commission. He currently serves on numerous corporate and nonprofit boards. He earned his masters and doctorate in international relations from Columbia University.